So thanks to the recommendation from Mikki Blu (did I get that right?) I checked out this M/M romance by Cat Sebastian, and I loved it! 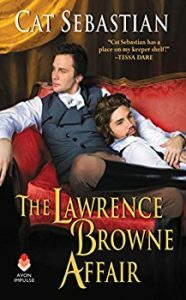 Lawrence is an earl with severe anxiety and a family history of mental illness. He is also an inventor and recently blew the roof off the conservatory. Georgie is a con artist on the run from his criminal gang after he went soft and did not swindle an old widow. They are thrown together in a ramshackle castle that has broken windows and mushrooms growing in the library. They are both afraid of themselves and have insecurities that they must face. The plot moves quickly and the romance is well paced. I enjoyed all the characters (and look forward to seeing some of them again in the next book) and appreciated the way their true natures were slowly teased out. And with all romance novels it comes down to the couple, and Lawrence and Georgie are a wonderful match. They fit together and bring out the best in each other, and it is clear why they fall in love. Their obstacles felt organic and came from their flaws and not just random plot jetsam thrown in their way. Share the post "Upbeat and Fun Romance"
Yes, that was me – glad you liked this one too. There’s a new book of hers scheduled to come out in July – “The Ruin of a Rake” the story of Lord Courtenay and Julien Medlock who made appearances in this book! I am excited for that one. And KJ Charles has a book out today, so I know what I am doing tonight. Hey there, I’m ready to try some KJ James. Can you recommend one that’s reasonably vanilla? I tried one of the Magpie ones, I think, and found the relations a bit much. Sorry, wrong review. I have beboughten this based on your review. Charles does a lot of different bed tastes that usually fit with the couple but might not be your thing, I get that. Think of England would be a good one, or Wanted, A Gentleman is nice too.